“Hamilton was the scariest but best two minutes of my life,” said Adriel James ’20, who got to perform on stage with the hit Broadway musical. 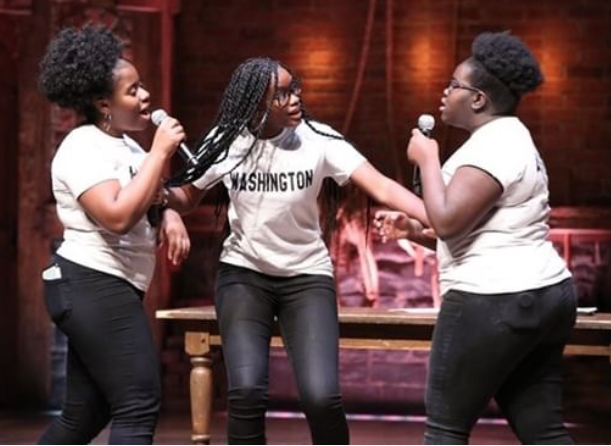 Not only did U.S. History students get to see Hamilton on November 14, but James and two other students, Adja Thomas ’20 and Pheona Angoy ’20, also got a chance to perform in front of an audience of 1,200 people at the Richard Rodgers Theatre. Hamilton, written by Lin-Manuel Miranda, is a musical that contains songs and raps about the life of Alexander Hamilton. The show has been a hit, winning a Pulitzer Prize in drama, an Emmy, two Oscars, and three Tony awards. Tickets can range from $200 to $2,000. But Midwood won 50 tickets, and lucky U.S. History classes were given the chance to go as long as they returned their trip slips and paid the $10 fee. In front of the crowd, Midwood’s Thomas, James, and Angoy performed an acapella version of a song they wrote on the debate over the Bill of Rights. Angoy played Alexander Hamilton, Thomas played George Washington, and James played Thomas Jefferson. They sang each character’s perspective on the Bill of Rights. With a massive audience to perform in front of, Thomas explained, the girls felt nervous. James added how “nerve racking” it was waiting for their turn to perform. Roie Cohen contributed to this article.